As I received some freshly bottled samples of three 2012 wines from my contacts at Yvon Mau, owners of Château Preuillac in the Médoc and Château Brown in Pessac-Léognan, I thought I would add my notes here. The two châteaux are co-owned by Bordeaux producer and négociant Yvon Mau and the Dirkzwager family, and though the properties are sited at opposite ends of Bordeaux’s ‘left bank’ territory, Jean-Christophe Mau is director of both estates. As always, these notes come with the caveat that these are unfinished wines that will spend another year in barrel before bottling. 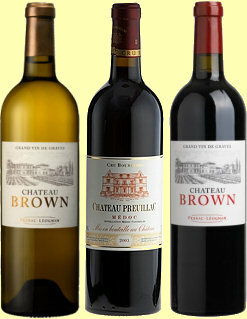 Preuillac’s 2012 is composed of 50% Merlot, 45% Cabernet Sauvignon and 5% Cabernet Franc. It pours a very solid, saturated colour and offers copious, forward and juicy black fruit aromas: ripe black cherries and blackcurrant. Oak is very subtle. On the palate this has a firm, sinewy, lean and meaty concentration. The sweetness of that cherry and plummy fruit is there, the Merlot adding bit of fleshiness, but it is the savoury grip and concentrated, liquoricy lick of tannin and acidity that gives this its drive. Very nice stuff in a slightly austere, but savoury style. 86-88/100. The blend here is 60% Cabernet Sauvignon, 35% Merlot and 5% Petit Verdot. Vibrant, solid, deep crimson/purple. The nose has a lovely subtle, cedary, lightly ashy feel, proper Graves terroir showing through, with earthy minerals, maybe just a hint of Cabernet greeness, as well as ripe black fruits. In the mouth this ramps up the fruit sweetness and fatness of the ripe fruit concentration considerably over the Preuillac, with a real core of juiciness and plummy flesh and tartness too, the rounding support of the oak adding another broadening layer. Smooth though present tannins and good juicy acidity complete a convincing picture. 88-90/100. The 2012 Blanc is a blend of 67% Sauvignon Blanc and 33% Semillon. Bright, pale straw/green, with fresh and youthful scents of apple and pear, and just a little hint of punchy nettle and fresh-cut grass. There’s a stoney citric background too adding a firmer note. On the palate it is vibrant and fruitily vivacious, the ripe orchard fruit flavours verging on the tropical with apricot and peach, but that squeeze of citrus juice acidity and the core of stoney, firm character adds a bit of backbone. Really very nice. 87-89/100. Various merchants will be offering these wines en primeur currently.